Nottinghamshire - Universities and colleges across Nottinghamshire and Derbyshire have come together to launch ground-breaking projects to tackle skills shortages and skills gaps in the region and support hundreds of small and medium sized businesses and organisations (SMEs) – by making sure the area is home to a talented workforce with the high level skills that SMEs really need. The projects are being led by Nottingham Trent University in partnership with Derby College, Nottingham City Council, Nottingham College, Vision West Nottinghamshire College and the University of Derby, funded by the European Social Fund. It has been developed in response to a need for high level skills and pathways in the area, also highlighted in the latest D2N2 draft Strategic Economic Plan for 2019-2030. D2N2 is the Local Enterprise Partnership for Derby, Derbyshire, Nottingham and Nottinghamshire. This is the first time universities and colleges in the region have worked together on such a big scale to develop employer-led learning and training in collaboration with local SMEs. The projects address two key priorities, making sure current and future employees have the relevant, high level skills needed to support local SMEs working in the region’s priority sectors and retaining graduates who study in the area, to keep high level talent in the region. 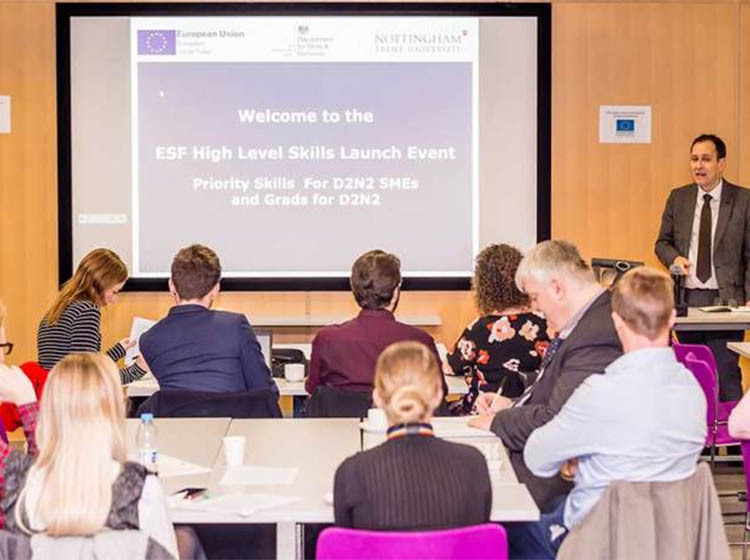 The Priority Skills for D2N2 SMEs project will involve providing bespoke, employer-led training, career coaching and advice to upskill and support people working in local SMEs across Nottinghamshire and Derbyshire. From higher and degree apprenticeships, to high-quality short courses focused on giving people high level technical and job-specific vocational skills relevant to today’s industries. It will focus on unlocking talent in the region by making the local workforce more diverse and inclusive, by supporting staff that may face barriers to accessing high level skills and pathways, including women, people aged 50+, people with disabilities, people from BAME communities and those who have missed out on traditional educational opportunities. The Grads for D2N2 project will work with local SMEs to ensure education and training is relevant to what employers need and that students graduate ‘work ready’. In addition, it will provide SMEs with grants to employ graduates, work with SMEs to design employer-led work experience and internships, and support SMEs to benefit from vocational routes to acquiring graduate skills, such as higher and degree apprenticeships. The projects, which are due to run until 2020, were launched to partners and organisations supporting local SMEs on 28 November and will be launched to SMEs in January 2019.